Superior vacation granted for our elite guests! owner in Cape Coral, Florida - no booking fees! 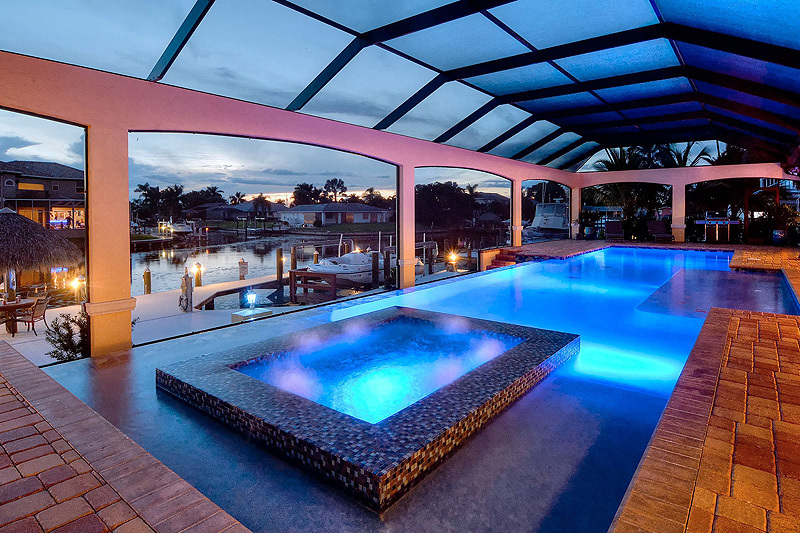 The here offered upscale vacation homes in Cape Coral feature a spectacular oversized "Disappearing Edge" Pool, a big spa, a roomy pool area with sun loungers for each and every guest plus a huge outdoor table, seating all guests comfortably. The pool of the Caribbean Island Dolphin View is including the spa 54 ft / 16.5 meter long and one of the highlights of our vacation rental houses. Should you wish to spend your vacation in one of these private vacation rental homes - which we planned and built – you will love the outstanding pool areas und the large lanais with BBQ grill. Each of the Caribbean Island vacation homes sleep 8 - 12 guests plus little kids - which of course are also very welcome as our guests. On request we can supply to the existing bedrooms which sleep 8 2 very comfy inflatable queen-size air beds, which are even comfy for 2 adults. There are 3 bedrooms plus 3 bathrooms and a guest room in the houses Caribbean Island Supreme Deluxe and Caribbean Island Grand Deluxe. The Caribbean Island Dolphin View offers 4 en-suite bedrooms, i.e. each has its own bathroom, 2 bedrooms are master bedrooms with master bathrooms, 3 out of 4 bedrooms have direct access to the pool area. You will find in our vacation homes a kitchen with excellent equipment – open style – and a very nice inviting living area. 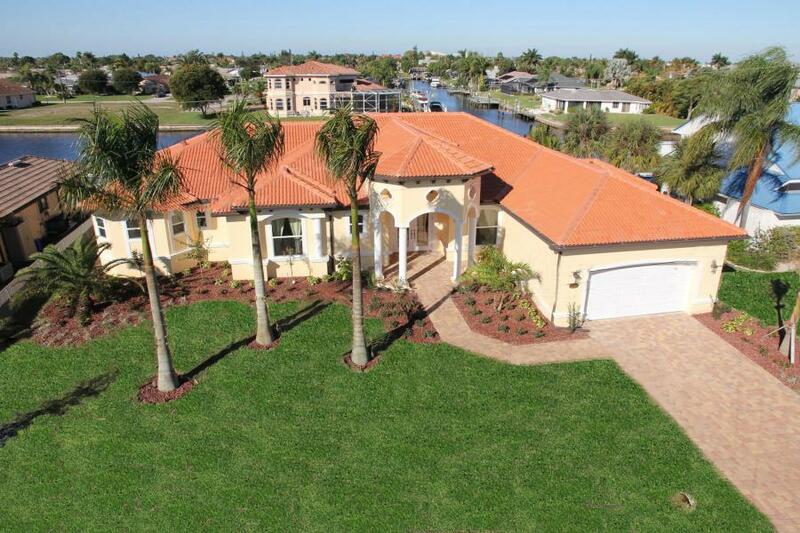 It is not easy to find between the many rental homes in Cape Coral the one that meets all your expectations. We do our utmost to please all our guests and to offer everything and more you may expect. If you are looking fort he right location to spend your vacation Cape Coral is a very good choice. Spend your vacation in one of our privately owned vacation rental homes located directly on a canal with direct access to the Gulf of Mexico, to be able to rent a boat to explore the nice waters and beaches in our back yard. Boaters and golfers find with our vacation rental homes excellent locations for your perfect vacation. Cape Coral is very close to Meyers, just a few minutes from Southwest International Airport in Fort Myers. *The Caribbean Island vacation houses sleep 8 adults in beds. For larger families we will be glad to offer up to 2 very comfortable inflatable queen-size beds to sleep up to 12 adults. Reviews of our guests you find for example under HomeAway/VRBO as there we offer also the private vacation rental houses Caribbean Island Supreme Deluxe, Caribbean Island Grand Deluxe and Caribbean Island Dolphin View, which you may also book exclusively with us. No one else is allowed to rent these beautiful vacation homes as we would like to make sure you learn what you get and what you pay for directly from us. The before mentioned vacation homes are licensed under license no. DWE4605801 at the Florida Department of Business Professional Regulation and fulfill all requested standards. The Caribbean Island vacation rental homes in Florida are unique dream vacation homes and offer a large amount of extras you may have on your wish list. If you are interested in one of our houses, just send an e-mail, make an easy click under contact or click on the call me back button. We are looking forward to answering all questions you might have in a personal call. Located in Cape Coral there is our always in a good mood being friendly property manager, fluently speaking English and German. She will take care about you during your vacation in our vacation rental homes in Cape Coral. Being in the Cape already for more than 20 years she is familiar with all situations - and our guests love her. The Caribbean Island rental homes offer a very special Caribbean flair und are individually equipped with high-end features. The houses Caribbean Island Supreme Deluxe and Caribbean Island Grand Deluxe are very similar as they were built with considering the same plan, the Caribbean Island Dolphin View offers some extras, has way more space and a breathtaking pool area with infinity pool and infinity spa in a pool area on 2 levels and a huge boat dock with a wide captain’s walk. You may use also those areas for sunbathing or to moor you own boat or a rental boat. Many of our sophisticated guests are repeating guests as they wish to spend their vacation either in the Caribbean Island Supreme Deluxe or in the Caribbean Island Grand Deluxe and are looking forward to come back again. A considerable amount of guests even booked our new Caribbean Island Dolphin View without having seen any floor plans or pictures of the house as they now that we keep our promises. We have rented ourselves many houses frequently in Florida since 1988, planned and built the vacation rental homes Caribbean Island Supreme Deluxe - Caribbean Island Grand Deluxe and Caribbean Island Dolphin View under the influence of all good and bad experience we have made. You will find plenty of pictures and virtual tours on our websites. We also provide information – for our guests on our website who like it short and for our guests who like to know each and every detail - under separate pages. It is our target to supply our utmost support and have all questions answered before you book. We are looking forward to receiving your call if you wish to discuss individual questions in person. Enjoy the challenge browsing the websites presenting the Caribbean Island vacation homes in Cape Coral!